Product prices and availability are accurate as of 2019-04-17 21:57:04 UTC and are subject to change. Any price and availability information displayed on http://www.amazon.com/ at the time of purchase will apply to the purchase of this product. The ideal light-weight, portable field hunting kit. This kit includes every tool to skin quarter and debone big game in a nylon pouch. Each knife is stainless steel with a camo ABS handle. 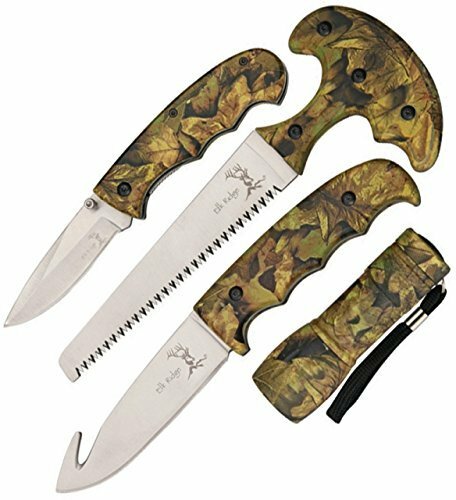 Includes one folder (4" closed, 3" blade), 8 3/4" saw (5 1/2" blade), 8 3/4" gut hook (4" blade), and flashlight (4"). Perfect for all needs whether beginner or advanced.